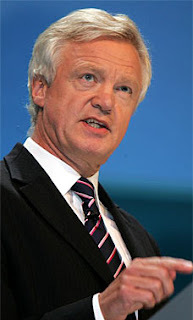 Mark Thompson: Why are the Tories not using David Davis more? It is now widely acknowledged that the Conservative election campaign is struggling. They have had several "wobbly" weeks since the start of the year with Cameron seeming unsure about the implementation of some of his own policies, dodgy statistics being used in a number of publications and most recently the Ashcroft problems amongst other problems. At the same time, Labour are showing their electoral mettle by sending in attack dogs like Mandelson and Prescott whenever they need someone to go at the opposition. And it seems to be working for them. We also have very strong media performers like Nick Clegg and Vince Cable from the Lib Dems. One thing I just cannot understand is why David Davis has not been called to get involved with the front-line of the electoral fight. He was a very effective Shadow Home Secretary and is a strong political street-fighter. He would surely do a better job batting for his side than some of the non-entities we see put up in front of the media by the Tories at the moment. Maybe it's because Cameron still feels slighted about how Davis stood down from the shadow cabinet to fight a by-election on the issue of civil liberties. I must admit I still find that decision a bit odd, almost quixotic but frankly Cameron cannot afford to harbour grudges like this. Maybe he could when he was 20 points in the lead but with the polls showing anywhere from a 7 to possibly even 2 point lead he needs his strongest troops up front with him. Cameron should not leave Davis languishing on the backbenches. How to you let yourself reach the conclusion that Cameron "harbour[s] grudges like this"? Davis' unnecessary by-election introduced unnecessary risks and, disappointing though it was to see, proved in outcome to be a largely pointless gesture. It could have done significant harm to the Conservatives and was a material breach of discipline, highly moral though it was. So someone who against instructions to the contrary proceeds to be "a bit odd, almost quixotic" is to be embraced not out of any principle but for electoral advantage? And that is a good thing in your judgement? It would be better if Cameron simply stepped aside and let Davis lead the party. Ha ha! I like the fact that Richelieu chastises Davis for potentially putting the party at "significant harm", even though the cause was moral, and then in the next breath claims that principles must be put before electoral advantage. Which is it? Make up your mind! @ Anon. last above - It is not a distinction that arises - one the one hand Davis was right to follow his principles but Cameron was also right to recognised that it was "a bit odd, almost quixotic and could have done harm etc.. So they both had a moral underpining to their own actions. That being the case, it would be foolish Cameron to take Davis back for the reasons Mark suggests might be appropriate - it would not be a principled action of the like of Davis' nor of his own in dismissing Davis. So I consistently suggest principle should prevail.